AAAAI 2015 Pro-Con Session: Is OIT Ready for Prime Time? Dr. Baker described the "slow" and "rapid" challenges that he performs. If he does not expect a problem, he performs the rapid challenge and if "the danger seems more imminent" he does the slow challenge. He described his 4 categories for patients - "Recent Positive", "Past Positive", "Unsure History", and "Negative History"
Dr. Baker stated, "[For] the patient that has a positive history/recent positive [recent reaction] [...] the majority of these patients who are well-adjusted to the avoidance management strategy, I stay there. We don't automatically go into the slow challenge/desensitization protocol, unless there is a maladaptive psychology approach to it. Many, many children now have their lives dramatically changes because of food allergy and this is really the driving force behind things." Dr. Baker stated, "it turns out that the slow-graded challenge and the desensitization protocol are essentially the same"
He has learned over time that certain factors affect the threshold response - exercise, infection, menstruation, total allergic load, gastroenteritis, vaccination, and uncontrolled asthma. Baker spoke about his “first 128 patients” on whom he collected and analyzed long-term data. “11% of patients who've actually outgrown [a peanut allergy] will get it back if they don’t add it to their diet." Some parents decided on their own that the “benefit-bother ratio was not in their favor”. “Another lesson I learned the hard way is that the health care decisions for an adolescent change somewhere between 16 and 20.” He explained that parents make the decision to treat and then that gets passed to the child and they want to ensure that the child will be willing to keep up with things after they turn 18 and leave home. As for the risk of EOE, he stated that it is rare. He has scoped 3 patients for it and none of them have had it. Dr. Wood’s position is that the answer to the first point is “No” and a “Yes”/”Of course” to the second question. Back to the risk:benefit ratio - what are the risks of the disease? They certainly occur, but it is hard to determine exact frequency, and there is variability based on the allergen. There are differences by age and other variables, such as those Dr. Baker described that can affect the tolerance of the food being taken. Fatalities - scary, but rare - "2 deaths per million persons in those with true food allergies"
“Severe reactions, again, thankfully, for those reactions requiring epinephrine are also rare - less than 1% of all doses. High number of doses 240,000 doses for 352 patients - 27% of said patients had a reaction requiring epinephrine. “Long-term outcomes are really the crux of the matter, here.” Dr. Wood stated that he would gladly accept a fairly risky therapy, if there was a great long-term result, but without any proof of the long-term outcomes, it limits that discussion. A couple of published papers on the subject show that there may or may not be a true quality of life (QOL) improvement post-treatment. The risks do not disappear post-treatment Dr. Wood contends that these risks may actually increase. large group with “occasional or even frequent symptoms"
“We appreciated that it would be hard for peanut, both because of aversion and maybe not feeling well or fear, but with milk we thought it would be quite easy, but it was not easy, at all. And the key question there - is it really more aversion, is it really more fear, or is it that they’re just not feeling well? And when you have a stomach ache every day, you’re inclined in a lot of instances to ratchet down your rate of exposure to that food and as you ratchet down exposure, you will run the risk of becoming more reactive..."
"If we're going to move this treatment forward, what are the outcomes that would really justify the use of OIT in clinical practice?" Increase in challenge threshold? - Dr. Wood stated that this can be done, except for the 10-20% of patients who cannot tolerate treatment, but "we recognize that in most people that will only be sustained with on-going exposure." A sustained increase in challenge threshold, which would persist without exposure? "That would be a slam dunk. We would accept, I think, the risks of treatment if we really had something that was more approaching a cure and one of the things that Jim & I agree upon is that we're nowhere near that." Improved quality of life? Dr. Wood stated that this was really important and could not be discounted, "but without adequate safety it is not going to be a final indication for approval of OIT, certainly, by the FDA." Reduced risk of reactions during treatment compared to strict avoidance? Dr. Wood stated that this will not happen, and "you're going to have more reactions when you're being treated, but if you could have a long-term outcome that really lead to sustained tolerance, that would be, again, potentially a very acceptable risk:benefit ratio." Reduced risk of reactions after treatment - Dr. Wood stated that this is our goal, but we are not quite there, yet. "[What] are the studies that are actually needed, exactly, to bring OIT to clinical practice?" Dr. Wood referred to the traditional drug approval process, "by usual FDA mechanisms." Dr. Wood reiterated that this treatment has only been able to move forward, due to the ease of acquiring the food products for dosing, "but does that really mean we should be completely bypassing the drug approval process, especially with a very dangerous drug?" Dr. Wood stated that at this point, we would be going through clinical phases I, II, and III and we are currently at the equivalent of perhaps late Phase II, "but there are no Phase III trials for food allergy and one of the problems in moving this forward, is that every trial that will be done is going to take 2, or 3, or 5 years..."
"My summary is that OIT holds great promise for the treatment of food allergy. There are other treatment modalities that are not part of this debate, today, that we think also hold promise, that OIT does carry significant risks, that the risks of food allergies - the disease - is very real, but potentially far less than the risk of treatment. As far as risk goes, I believe without a doubt this will be the most dangerous treatment you ever prescribe to a patient. There is nothing you prescribe that's in this, even remotely in this realm of risk. And how then can you argue that the usual trials of drug development should be bypassed for any treatment, much less this one, that carries such significant and potentially lethal risks. So, I really am completely in favor of on-going OIT studies, I am completely in favor of the development of other treatment modalities, but to run this treatment, at this phase of research, out to the public is completely wrong." Moderator: The moderator stated that there would be two 5-minute rebuttals, first by Dr. Baker and then by Dr. Wood, followed by a brief panel session, with questions from the audience. "I think that what I'm worried about is waiting for an expensive solution. I think that would take it out of the realm for a lot of people. I'm worried about that. I worry that quality of life issues are dramatic and I still think that warrants taking some risks in this regard." 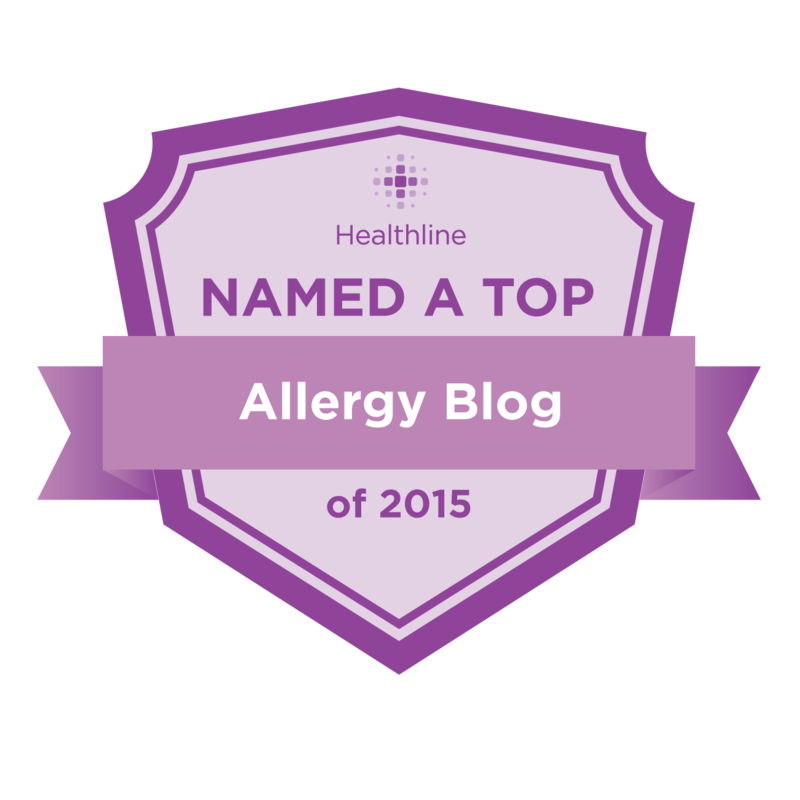 "There are only 3 conditions that I can think of where immunotherapy has been used in a life-threatening disease - bee sting allergy, aspirin allergy, and food allergy. Now, I don't think we've cured anybody, or cured 100% of people in any one of those categories. [...] We've reduced the risk in those categories, but I don't think we are absolutely successful. And the null hypothesis for a preventative study is much more difficult than for a remedial study." Dr. Baker explained that the "null hypothesis has to include the words such as 'had you not been on this you would have had more trouble?' and I think that would be an extremely difficult thing, to ever produce a drug that's going to achieve that type of efficacy." Dr. Baker contends that post-treatment, patients "pass their challenge every day" and he admits that there are tremendous compliance problems, and "exercise-induced food-dependent anaphylaxis is a huge problem and with my high school athletes we separate this treatment by at least 5 hours from any vigorous exercise." Dr. Baker said that he most wanted to argue for a change in the indication for food challenges, more of which he thinks need to be done. He observed that none of his patients with a history of atopic dermatitis had flares as a result of treatment. Dr. Baker stated, "I agree that milk is the one to stay away from - it's the most difficult one to desensitize." He believes egg is the easiest, peanut is in between, but "milk patients surprise you and so I discourage it in that group." Dr. Wood agreed with Dr. Baker and said if the topic of the debate was "Should We Do More Food Challenges" then the answer would be a definite yes, and there would be nothing to debate. Dr. Wood stated that, "expense is not a reason not to do the appropriate studies." He mentioned that most of them know of drugs that they would love to have in their clinics, but "we need to wait for the studies to be done to show what its proper indications are, it's risk:benefit ratio is..."
Dr. Wood closed his rebuttal stating that he is concerned that the information has not been obtained on the long-term risk:benefit ratio and that "just showing that you get some bump in challenge threshold is many steps away from that kind of study, not just showing a short-term risk:benefit ratio, but a long-term risk:benefit ratio." Audience Member (A/M) #1: The A/M stated that Dr. Wood might have done too good a job at convincing them that OIT is not only not ready for prime time, and that perhaps it might even be a bad approach, all together. Dr. Wood: Dr. Wood stated that it would depend on the long-term outcome. He stated that he would love if in 5-10 years, we could have a variety of options and "OIT should be on the table, but there may be other options that won't provide the dramatic increase in threshold, but may provide the same level of safety that our patients really want." He mentioned that information on the peanut patch would be presented later in the afternoon, and he thinks that people will have options in a few years. However, "saying that because you might like to give your patient the patch, because it's a little safer, but because [OIT is accessible now] you're going to do OIT, instead, that is not the right way to move this field forward." Audience Member #2: The A/M stated that they started out and remain ambivalent about OIT and that they have visited Dr. Baker's center and read many papers and their hope is that both Drs. Baker and Wood could get together and either "define protocols that would allow appropriately trained individuals" to do OIT, or decide that OIT has been tried and it's time to move on to some other treatment. The A/M stated, "I'm a little bit bothered by the fact that 10+ years down the road we seem to still be at the same point of debating not only whether or not it's ready for prime time, but is it ready for patient intervention." The A/M asked for their thoughts. Dr. Baker: "I've always felt that we should do the most dangerous thing that the patient's ever going to do, in the office and we get over that hurdle and then everything they do at home is less dangerous than what they do in the office, and so I've always taken that approach." Dr. Baker reiterated that he still uses the avoidance-management strategy "in patients that are well-adjusted to it. The ones I really go after are those whose parents are paralyzed by this" and he feels the benefit:risk ratio is favorable in those cases. He continued on to say, "These kids lose their identity - their name is no longer 'Johnny' it's 'the kid with the peanut allergy' and these kids' lives are tremendously changed and I'm extremely sensitive to that and that's why I'm willing to go out on a limb and it is disruptive to academia to do this and I fully recognize that." Dr. Wood: Dr. Wood agreed that we should feel ambivalent, given that we don't have all the data. He agrees that the large studies need to occur and in many data centers, etc. As for 10 years' time, he said that is, in the development of a new treatment, a very short time and we should not get discouraged. He clarified, though, that it has actually been slightly less than 10 years, as "the first double-blind study of food immunotherapy" was started in 2006. He stated that this field will move more slowly, out of necessity, as safety needs to be the driving force and due to the length of each phase of study. "We use the word 'equipoise' when we're talking about this and this is my most perfect example of equipoise - we just don't know enough to say if we're on one side of the fence or the other." Moderator: The moderator chimed in to mention that two companies were at AAAAI who just finished Phase II clinical trials - Allergen Research Corp. (ARC) [Now Aimmune Therapeutics] and DBV Technologies - and he felt that a Phase III will probably be somewhere in the near future. Dr. Baker then asked Dr. Wood how he would have managed his hypothetical patient (17-year-old soccer player, originally seen at age 2 with hives and shortness of breath after eating peanuts, positive SPT and had successfully avoided peanuts until the present. The patient developed EIA [exercise-induced asthma] at age 12. He had an accidental bite of a candy bar, which he discovered contained peanuts, but he did not react, despite coming in and finding he still had a "very positive" skin test...) Dr. Wood responded that he was "a perfect example of a kid who went 15 years with no reaction and he might have been highly allergic - and that's my average patient. You know, my average patient, their worst complaint is that 'I've now thrown away 65 EpiPens, because I never had to use one' and I say, 'that's the best insurance plan you ever had' [...] most of my patients are going 5...8...10...15 years with no reactions, whereas my patients in these studies...And you were completely correct, this is a 24/7/365-day monitoring, because there's not a day that my phone will not ring - I give them direct access to my phone, when they're undergoing this treatment because reactions are so common and it's so different from the patient who is on strict avoidance, where reactions are so uncommon." Dr. Baker: "What do you think about my plea for [more] food challenges?" Dr. Wood: "I completely agree." Audience Member #3: An audience member asked a question bringing up the Lack study (The LEAP Study) but Dr. Wood stated that it was not pertinent, as it was a different approach, so the A/M clarified their question to ask if any study had been done to compare the severity of reactions in OIT versus the severity of reactions in the placebo arm. Dr. Wood stated that they had not really looked at the data in that way, but there was data on the frequency of severe reactions. Audience Member #4: The A/M expressed their concern, feeling that this was a vulnerable population that would "do anything for a cure." They expressed their concern for their ability to get informed consent as they "don't know enough about the long-term to tell them what they'll wind up with and I do worry about the long-term follow-up...I think we really need to see that, because I don't think families think about that - they think about the immediate, 'I want to get beyond this, my child could potentially die.' and I'd also like to have markers or some way to tell who's not going to tolerate this from the start, so that we don't put patients on it..." They stated that they can ask question to see if things like EOE are developing, but they are not sure if just removing peanut will make it go away or "will we have started a process that other foods will become sensitizing and now we've given them a long-term problem in addition to the one they had before." Dr. Wood: Dr. Wood mentioned that he had 5 other slides that he didn't get to that were just on those very points. He added, "I think the risk of this approach is only going to be magnified as it goes out to greater numbers..." [...] "This is a very hands-on, one-on-one kind of thing - it's going to be very hard to duplicate in the real world." Dr. Baker: Dr. Baker agreed, noting that he now has about 300 patients and it's difficult to maintain an intimate relationship with that many patients. He stated that the "manpower issue" is very problematic. Due to this issue, he is not currently accepting new patients. Audience Member #5: "A couple of comments and a question - Should we be calling this 'oral desensitization' instead of 'oral immunotherapy'? And what happens if there is a fatality and we're providing this oral immunotherapy or desensitization in an office where there might not be the oversight that we have in the clinical studies? What will that do for the progress of the research? And then, finally, how ethical is it to provide such a treatment, if it seems likely it may be worse than the disease?" Dr. Wood: Dr. Wood noted that as long as the word "tolerance" isn't used, it doesn't really matter whether you call it immunotherapy or desensitization, though he mentioned that he felt the term "specific oral tolerance induction" was "just wrong." As to the question of a fatality, he stated, "When somebody dies this whole process will shut down pretty quickly, and especially it will be a problem if it is not done in an FDA-approved protocol. And I think anyone doing this outside the confines of an IRB protocol is, right now, at substantial risk and this is what the next studies are needed for." He noted that some will say FDA approval is not needed, since foods can be purchased in the grocery store for treatment, but he stated that bypassing the FDA would be an extremely worrisome direction. Dr. Baker: "My brother's a malpractice defense attorney and he does say that an error of commission is much harder to defend than an error of omission by a patient and so I'm acutely aware of that." He noted that they, instead, use a "memorandum of understanding" with the patient and practice agreeing to do their respective parts. He stated that "Informed consent never gets into evidence. Informed consent is part of the battery law and not part of the negligence laws and the negligence law's where we could be in trouble. It's a significant problem and I can't erase it." Audience Member #6: This A/M recounted a story about a patient they had on OIT that experienced side effects and dropped out. That patient was also on asthma medication and after a while was feeling better and decided, on their own, to stop taking their medication. The patient later developed a viral respiratory illness and ended up in the ICU. The hospital staff questioned the patient/patient's family, wondering what kind of bad doctor they had, but the patients confessed that they were the ones that unilaterally decided to discontinue taking their asthma medication. The A/M's point, they stated, was that if the patient had still been doing OIT, "I would have been completely at risk for what happened to him, as everyone would have assumed that anything that happened to him, that illness was worse because of [the OIT], rather than the viral illness. So I think there is a risk to people doing this, because if anything unusual happens it's going to be brought back to the fact that this patient's on oral immunotherapy. I think it's also going to muddy the waters about how effective it is." Audience Member #7: This A/M expressed their frustration that there didn't seem to be any consistency among the experts. "We have posters and presentations [on OIT] for quite a few years and they'll play up the safety and the efficacy of it and they won't find a big problem with it and then we come to a Pro/Con debate where there are some really big problems, sometimes, so I think that has to be ironed out, there has to be some kind of consistency of approach." The A/M commented that there are so many protocols that even if they agreed to offer OIT, there isn't yet a standard to follow. This infographic is an "oldie but goodie" and merits a second look, if you haven't seen it in a while. This free site provides lessons on a variety of topics. I was first introduced to it through their offering of coding skills lessons, but they have since expanded their catalog. One notable addition, for our crowd, is the section on Immunology. It's a great primer on how the immune system is supposed to work, and provides a foundation for understanding how atopic immune systems have gone awry. I've spent many an hour down the rabbit hole that is PubMed! Whenever new information is released, I think it is in our best interest to read as much of the journal article as we can, whether that's the abstract or in some cases, the full study. When reading an abstract, it's best to read it all, and not just the "Results" section, because key details are provided in the Background, Objective, Methods, and Results sections. 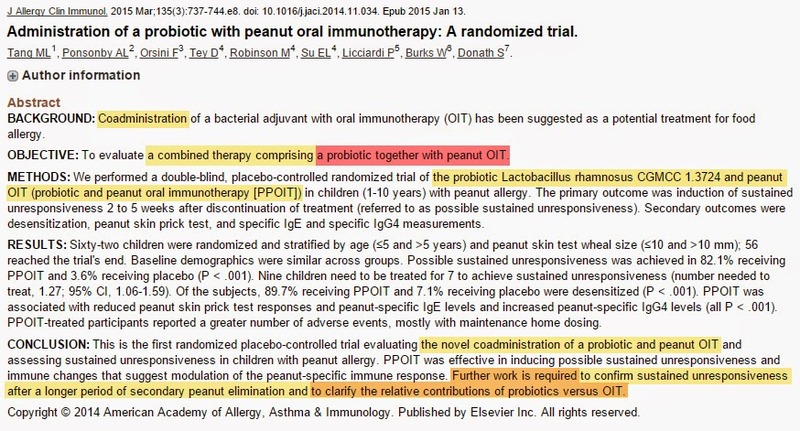 In the "Objective" section, it states that this was a study of a "combined therapy comprising a probiotic together with peanut OIT." I will admit that the wording that follows in the "Methods" section is a little confusing, but it states that probiotics plus peanut OIT was tested against a placebo. It is also noted that they chose the acronym "PPOIT" for their study, which is not to be confused with "Private-Practice OIT." The "Results" section describes the findings, which show that the results were compared against a placebo group, which received no treatment. This was not a study of probiotics vs. probiotics plus OIT, as the "Conclusion" section states that further study would be required for such a comparison. PubMed's journal articles can certainly come with their own version of spin and untold stories behind the scenes, of course. Even so, that is kept to a respectable minimum and there is so much to explore! If you'd like a comprehensive tutorial on PubMed, check out the PubMed Tutorial. Do you have any go-to research sources you'd like to share?